Anaesthetics were not used in surgery before 1842, when dentist William Clark extracted a patient's tooth using ether for the first time. Prior to this, surgeons were obliged to favour speed over accuracy during operations - regardless of the severity of the condition they were trying to treat. In the early 19th century, surgeons had no standardised or accredited training, working their way up through a system of apprenticeship like any other trade. 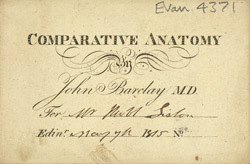 In an age of such widespread ignorance of human anatomy and disease, lectures such as this one from John Barclay drew large audiences - from the general public to apprentice surgeons, right up to leading scientists, artists and politicians.